ETTU.org - Czech 1st League match attended by 3.962 spectators! Czech 1st League match attended by 3.962 spectators! Since ice-hockey has its open-air „Winter Classic“, Czech table tennis players decided to present an exclusive match in front of shop windows. 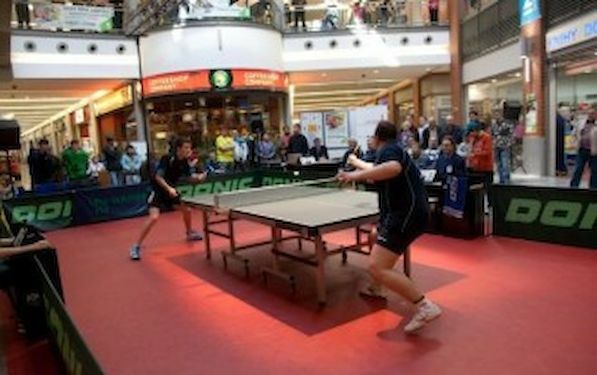 Last round match of the regular season of the men’s 1st League between SKST Liberec and Moravska Slavia Brno was played at the Liberec’s FORUM Shopping Centre on Sunday, March 25 as TABLE TENNIS CLASSIC 2012. The winner of the match was supposed to reach Play-Off Semi-Finals so the match was not just a friendly case. The fight was very close and visitors, Moravska Slavia Brno reached 10-8 victory against the home team SKST Liberec. Organisers set out a courageous target – to beat unofficial European record in the national- competition match attendance. The last year record of Bundesliga, the top attended competition in Europe, was 4,800 spectators (according to the tischtennis.de). Therefore each visitor, who agreed to be registered as the spectator, received as a souvenir numbered table-tennis ball (and had a right to participate in the drawing for € 20 shopping coupons). Lucky winners were drawn by players of the winning team. Organisers registered 3.962 spectators. European record was not beaten, however, the Moravska Slavia Brno captain Marek SMERDA (39) pointed out: ”So many people have not seen me playing in Czech Republic as long as I play table tennis.“ The players enjoyed absolutely fair conditions for their game. Organizers prepared taraflex and regular court lightening. “This is better facility than we usualy have in our home hall“, offered the overstatement Martin JAHODA, star of the home team. TABLE TENNIS CLASSIC brought top table tennis. The match was dramatic until the end and full shopping mall foyer often applauded to players. The Czech TV broadcasted pictures from TABLE TENNIS CLASSIC 2012 on its Sports Channel Four on Thursday, March 29.